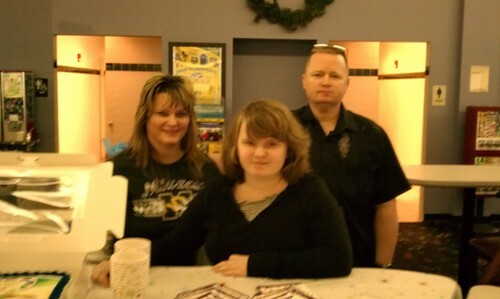 This weekend we celebrated our youngest daughter Leah’s 17th birthday. It’s so hard to believe she is that old. It seems such a short time ago that she was a newborn baby in a long pink nightgown. Some of the boys who came to the party became quite competitive: Nicholas, Aaron, and David. I was beginning to wonder if it was going to turn into a bloody gladiator game. What is it about sports and male testosterone? 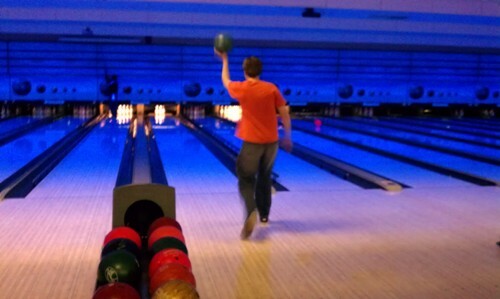 Here to the left is Nicholas bowling. I thought it was a good picture of him in action. 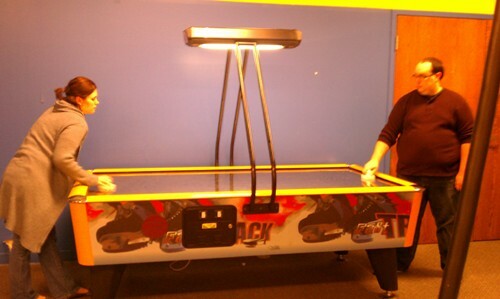 Here are Heather and Kyle playing a game in the arcade…or is it really playing? They are both very competitive, too. 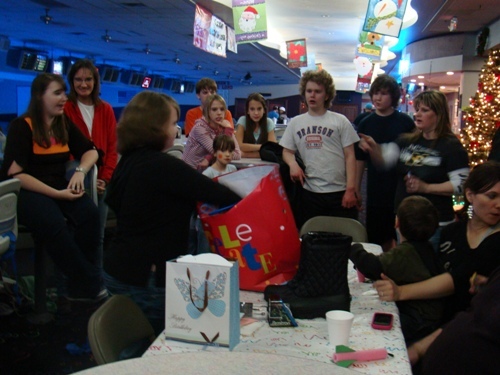 You can see the determination on Heather’s face in the picture, lol. I had ordered Leah’s cake from the local bakery. 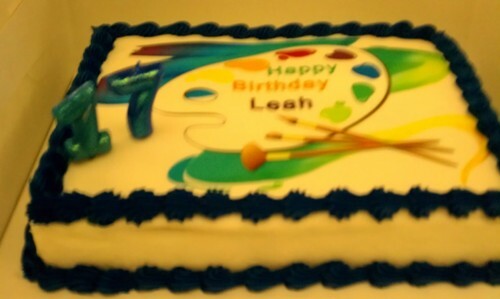 Leah is an incredible artist, so she and I picked out a cake with an artist palette on it, which was really cute and so Leah-ish! 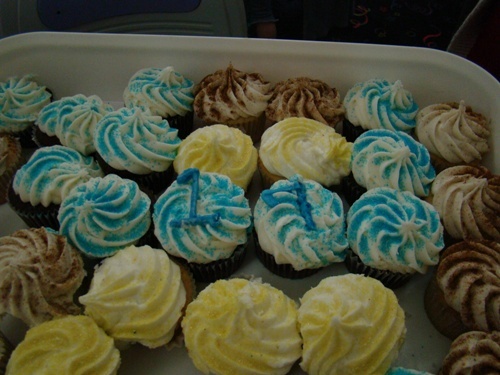 They did a good job on it (both decoration and taste!). Ray’s dad took some great pics for us with his camera. 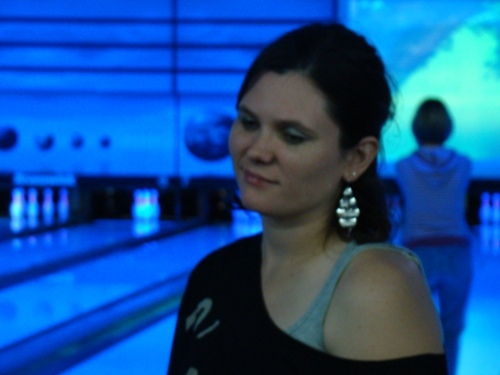 Here was a gorgeous one of Heather. Ray says it looks very Aubrey Hepburn-ish. I love the stark blue background, too. This is not an edited picture. Eden works at a bakery, making cupcakes each morning. She also has a side business baking cupcakes. She made some for Leah’s party – eggnog, mint, chocolate, banana. They turned out pretty. She’s having fun with her cupcake business. The little kids loved the arcade. 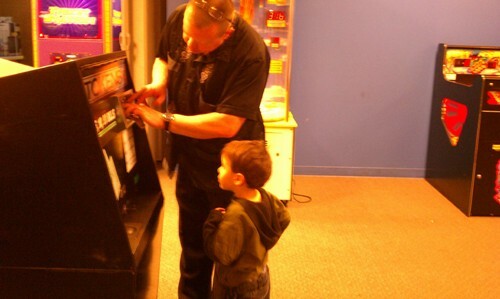 Here is Ray, putting in another dollar to get our grandson Jacob coins to play more games. 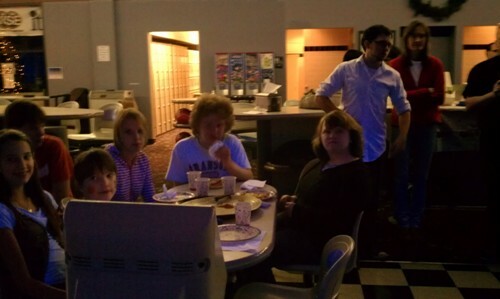 Jacob ran all over the bowling alley, tried all the games, and had a blast. 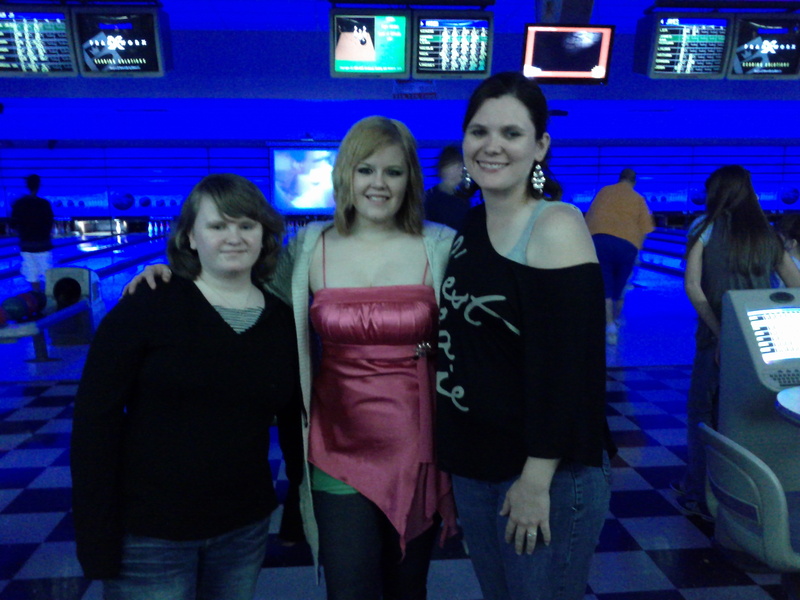 Eden, her fiance’ Dalton, and Heather chased after him all night. 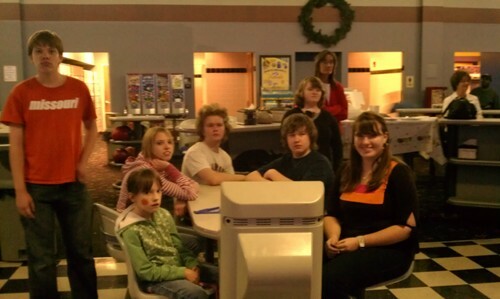 Here are Leah and her friends watching the bowling.I think they like having their picture taken as much as Leah does. One of the gifts Leah asked us to get her was a warm, soft bathrobe. (We also got her some snow boots, a set of Ipod earphones, a new watch, and a silver snowflake necklace with 1/4 diamond in it.) Leah’s friends teased her that she could fashionably wear her robe with her new snowboots. I love seeing her smile and laugh like this. 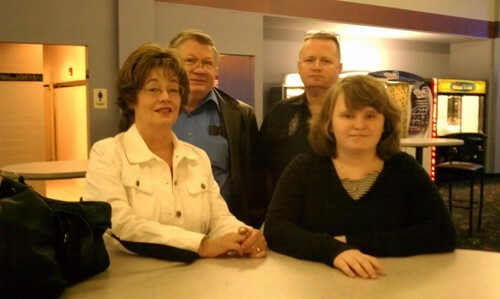 Ray’s parents, Charles and Sue Jones, drove in from Arkansas to help celebrate Leah’s birthday. They’ve been visiting us since Thursday. I am not well-known for my culinary abilities so when guests come, I have to actually think of decent meals to cook. :O On Sunday after church, I crashed in bed, asking Ray to please feed his parents my home-made potato soup that I had fixed for them on Thursday night. As he was dipping some in a bowl for his dad, the bowl fell off the countertop onto the floor, and the soup splattered everywhere. Ray hurriedly cleaned it up before I woke up and saw it, screaming. :O His dad told me about it later, laughing, when I asked if they got enough to eat for lunch. He said things hadn’t exactly gone according to plan. All of us had a good time at Leah’s party. 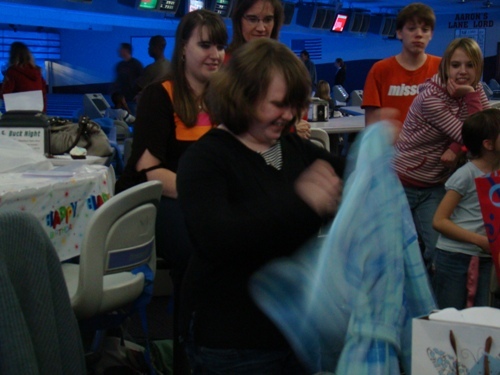 I was so blessed to see her having fun with her family and friends. 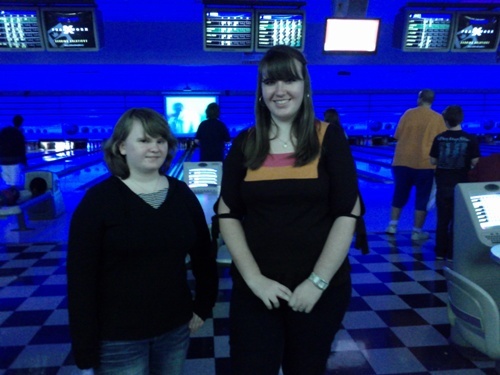 Here is Leah with her friend Nicole. Nicole has been a great friend to her, as well as her sisters and brother. Here is Leah opening some of her gifts. 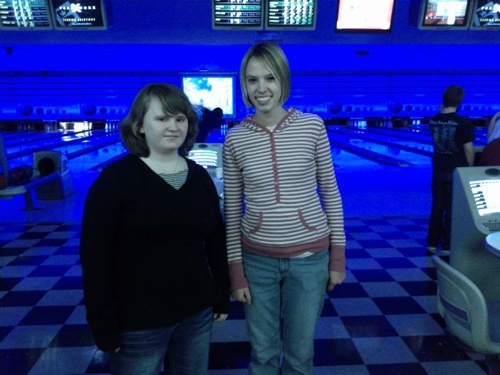 Here is a pic of her with her friend Kinsey. Leah had a great birthday. Thanks to everyone who helped make that possible. Leah, I hope you had a happy birthday. We love you so much! Be sure to cherish the moments with your kids. They fly by.